In the immediate post-WWII period, the U.S. Army Air Force issued study contracts for various general surface-to-surface missile requirements to several aerospace companies. These studies included North American's project MX-770 for a supersonic missile with a range of 800 km (500 miles), increased to 1600 km (1000 miles) in April 1947. In that year, North American received a contract under project MX-770 for the development of the SSM-A-2 Navaho missile. 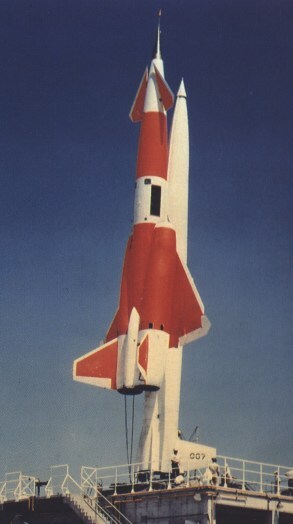 The XSSM-A-2 design (North American Model NA-704) had an integral rocket booster and two fin-mounted ramjets for cruise propulsion. In late 1949 the first XSSM-A-2 missiles were under construction, but in 1950 the whole Navaho program was redefined to develop a missile of much longer range (8000 km (5000 miles)). In September 1950, it was decided that the development of the Navaho (designated Weapons System 104A) would become a three-phase effort. A turbojet-powered RTV-A-5 aerodynamic test vehicle would be followed by the SSM-A-4 Navaho II ramjet-powered test and evaluation (and possibly interim operational) model, and later by the ultimate SSM-A-6 Navaho III full-range operational missile. North American's XSSM-A-4 and XSSM-A-6 designs were better known by their manufacturer's numbers G-26 and G-38, respectively. 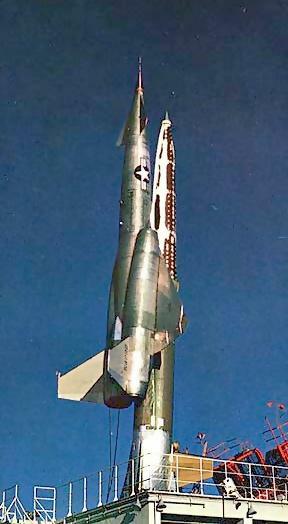 The B-64 design used a large liquid-propellant rocket booster to launch a ramjet-powered cruise missile of canard/delta configuration. The test flights of the X-10 between 1953 and 1956 verified the basic aerodynamic design of the cruise stage, and in late 1956 testing of the G-26 was to begin. At that time, the XB-64 (G-26) and XB-64A (G-38) had been redesignated as XSM-64 and XSM-64A, respectively (and the missiles renamed to plain Navaho without suffix numeral). However, the XSM-64 suffered from a bewildering list of problems, and the first flight in November 1956 ended after only 26 seconds when the vehicle disintegrated because of longitudinal oscillations. The fifth flight of an XSM-64 in August 1957 was actually the first one to proceed until ignition of the cruise stage's ramjets. The XSM-64 was launched from a pad by a large booster with an XLR71-NA-1 two-chamber liquid-fueled rocket engine. The booster accelerated the missile to almost Mach 3 at an altitude of more than 12000 m (40000 ft). Then the two Wright XRJ47-W-5 ramjets of the cruise vehicle ignited and the booster was dropped. Maximum cruising altitude of the XSM-64 was 24000 m (80000 ft), and it could reach a range of 5600 km (3500 miles) at a speed of Mach 2.75. The missile used a North American N-6 inertial navigation system for guidance, but was also equipped with a radio-command uplink and telemetry downlink for testing purposes. It also had a landing gear to reuse the missile after a successful flight, but not a single flight test ever proceeded as far as a landing attempt. The warhead section of the XSM-64 was designed to accomodate an early fission warhead (like the W-4 or XW-13), but after the invention of the thermonuclear bomb in the early 1950s, the XSM-64 was regarded as a pure test vehicle and no longer as an interim tactical missile. The XSM-64 program was extremely troublesome, and after only four launches between November 1956 and June 1957, all ending in failure, the USAF cancelled the development of an operational SM-64 missile in July 1957. As an interim long-range strategic missile, the SM-62 Snark was far ahead in development, and in the longer term the SM-65/CGM-16 Atlas and SM-68/HGM-25 Titan ICBMs were much more promising. After the cancellation of Navaho, seven more flight tests occurred until November 1958 to use up some of the sixteen completed XSM-64 vehicles. None of these tests resulted in a 100% successful full-range flight. The design of the ultimate XSM-64A missile (Model G-38) was completed by North American in February 1957, but the cancellation of Navaho meant that no XSM-64As were completed. The G-38 was basically an enlarged G-26 to accomodate a 4 MT W-39 thermonuclear warhead, and used improved RJ47-W-7 ramjets. 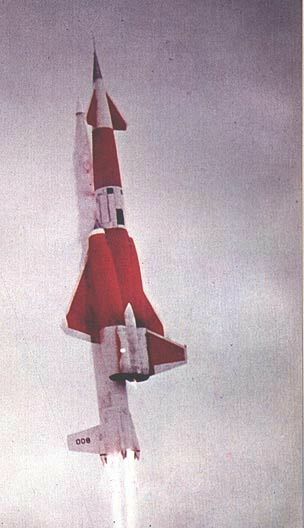 The booster was also much larger and used a three-chamber XLR83-NA-1 engine, an improved development of the G-26's XLR71. Other differences between the XSM-64 and XSM-64A included the latter's changed wing and canard planforms and single vertical tail. The XSM-64A was to use an N-6B inertial navigation unit, and planned range was 10000 km (6300 miles) at a speed of Mach 3.25. 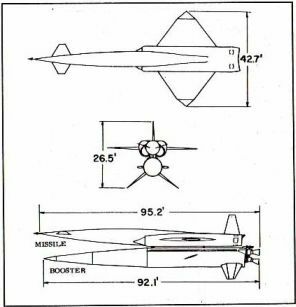 G-38 test missiles would have been recoverable, using a landing gear consisting of nose wheels, a rear skid, and wingtip skids. Height 2.90 m (9 ft 6 in) ?